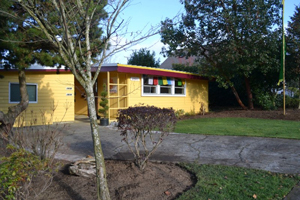 The Nalanda Institute now holds activities at The Nalanda Dharma Center at 1620 4th Ave E, Olympia, WA 98506. Parking is on the street. The Nalanda Institute no longer meets at Lien Hoa Temple except for special events. Take the Pacific Ave. exit (#107). Turn left onto Pacific. Continue on Pacific for one mile. Pacific then becomes State Ave E. Look for Ralphs Thriftway on the left. 3 blocks after Ralphs Thriftway, turn left onto Lybarger St. After 1 block turn left again onto 4th Ave E. Nalanda is on the left mid block. Take the Pacific Ave. exit (#107). Turn right onto Pacific. Continue on Pacific for one mile. Pacific then becomes State Ave E. Look for Ralphs Thriftway on the left. 3 blocks after Ralphs Thriftway, turn left onto Lybarger St. After 1 block turn left again onto 4th Ave E. Nalanda is on the left mid block. Take 4th Avenue East out of downtown. The Dharma Center is on the left about 1 mile from downtown Olympia between Lybarger and McCormick Streets. If you come to Ralphs Thriftway Grocery Store, you've past Nalanda by 2.5 blocks. Take Pacific Ave or Martin Way out of Lacey. Pacific Ave and Martin Way merge together into State Ave E near Ralphs Thriftway Grocery Store (on your left). 3 blocks after Ralphs Thriftway, turn left onto Lybarger St. After 1 block turn left again onto 4th Ave E. Nalanda is on the left mid block.